Just a quick birthday review of my PHEVs. Now for people that do not know me I own 2 PHEVs. 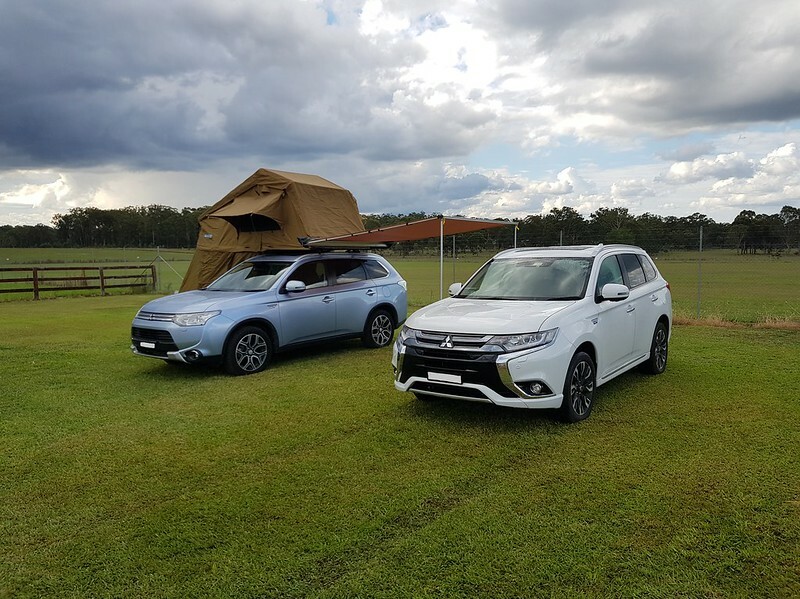 I bought one of the first PHEVs that were available for sale when released locally here in Australia in early April 2014 and bought another new one in April 2018. So from me Happy 5th birthday PHEV No 1 and Happy first birthday PHEV No 2. I would love to take you both out and wine and dine you and then take you to bed and lavishly oil you all over and .............oops did I write that out loud. But seriously, what can I say about them? Still love the bloody things. I have owned some of the so called "luxury" cars over the years, the cost of will push you into the Luxury Car Tax bracket that applies over here, and the PHEV to me compares well with those so called "luxury" cars. What I do not miss with those "luxury" cars is the higher cost of purchase . I also certainly do not miss the jealousy by some here in Australia of owning those "luxury" cars. I drive around with all that technology in the PHEV that's hidden away and goes unnoticed by most. Yep I like to being incognito in the PHEV very much these days. But its just a "Mitsubishi" some might say. But I would just call them brand snobs. So the 2 PHEVs I own so far have never broken down per se. My wife did have a puncture with the first PHEV and by talking to me over the phone my oldest son who was with her was able to keep it going till they got to me at my factory where I was able repair it. This was on a Sunday and the tyre repairers were shut here. That little air compressor in the back of the PHEV actually worked in helping get them to make it to me. Who would have thought that? Now fuel use has to brought up IMHO when owning a vehicle like the PHEV. I have now owned 4 Hybrids or HEVs. 2 Toyota HEVs and now 2 Plug-in HEVs or PHEVs made by Mitsubishi. Why do I buy Hybrids? For me I love new technology. Always have. I have always considered myself a bit of a trend setter. I also like to try and reduce fuel use to try and help the planet and its future resources. I know I can afford to pollute the planet more with my personal circumstances but I am trying to do my bit with Hybrids or HEVs and solar electricity generation as well as only having 2 kids to try and slow the human population growth. Some here might might even call me an "eco nut". So be it. You can call me anything except do not call me "late for dinner" I would say. Pure EVs or BEVs are not suitable for my family use at this stage but will probably be further down the track I think. Now our fuel cost on the PHEVs has gone to roughly 1/2 compared to our old Toyota hybrids or HEVs (Prius and a Camry) which were better than any conventional car I have ever driven at the time. So we now have bigger vehicles with the PHEV and IMHO more practical when we look at what we can haul in them running around at roughly 1/2 the fuel cost of those Toyota HEVs I owned. This includes the cost of electricity from the grid for all the local travel. As a comparison for others I pay approx 15 cents/kWh for my off peak electricity, from memory, for charging. That is in Australian currency. 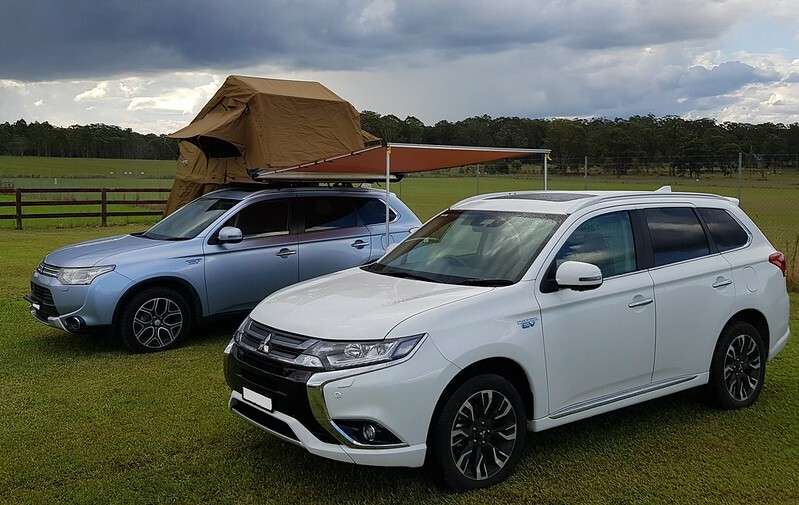 So what is "downside" with the Outlander PHEV? Well I have owned other Mitsubishi vehicles before. They have been good reliable vehicles for me and my business just like some other well known manufacturers but the dealers and the distributor here are still not up to date IMO with PHEVs. Some auto mechanics I would go so far as to say seem to be scared to learn the PHEV's different systems compared with conventional cars. But I think they are getting better from what I have seen. There is no doubt I feel a bit like a "Beta" tester with the dealers over here sometimes but I think that is to be expected with something that is so new to Mitsubishi here ie hybrids or Plug-in HEVs or PHEVs. I went through this with Toyota with their hybrids with the dealers here as they learnt the nuances of hybrid technology. This does not worry me, but it may others, probably because of my profession as a design engineer. I also have to learn new systems fairly regularly. What do I want from the future with PHEVs or even BEVs? Better and/or even cheaper drive batteries which I am pretty sure will come with time. I am also still waiting for my flying car. And I would love for Mitsubishi to make a PHEV utility 4 X 4 like the Triton ie I want a Mitsubishi Triton PHEV 4 x 4. Then I could sell this Ford Courier diesel 4 x 4 ute that I mainly drive and I can join you lucky people that get to regularly drive a PHEV. Well put, Trex. I, too just love my PHEV. I don't follow trends or worry that I'm driving the "wrong" brand. I'm past all that, long ago. It works, it doesn't break down, and it suits my usage pattern. That'll do. Oh, and I still want to drive it for the sheer pleasure it gives, and I haven't felt like that about cars for 20 years. Thanks, and good to see you still are enjoying the PHEV as well. Just thought I would put a photo of my 2 PHEVs taken together. Mounted a tent and awning on the roof racks of our first PHEV for my oldest son to go camping and was checking how it all folded out. Weather was not the best when this photo was taken. You know what? I still prefer the look of the pre-facelift PHEV. I really can't be doing with all those angular chromy bits. They add nothing to the looks in my opinion. I don't mind the front of the newer PHEVs myself. Here is another photo from a different angle. 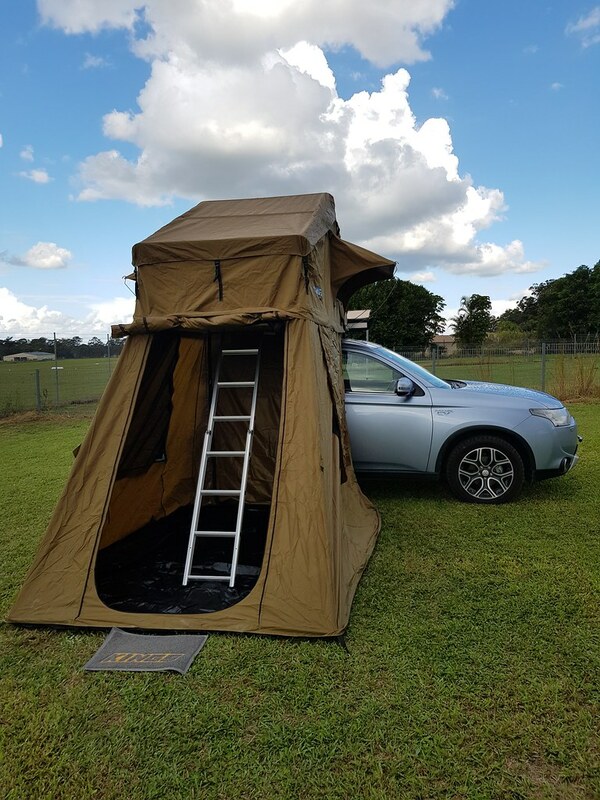 Another showing how how you get to the tent on the roof of the PHEV to sleep. There is enough room behind the ladder to bunk down as well. The tent maker even gave us a mat to wipe your feet before entering. 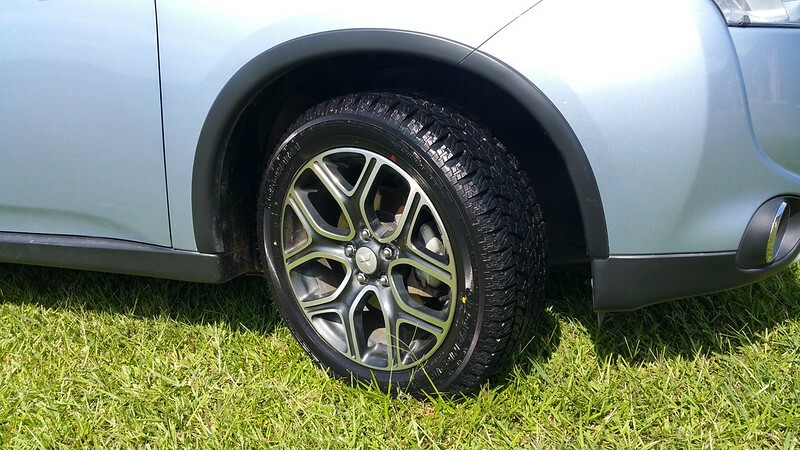 Another showing the All Terrain tyres we have had on our first PHEV for awhile now. Your blue PHEV is a twin of mine.